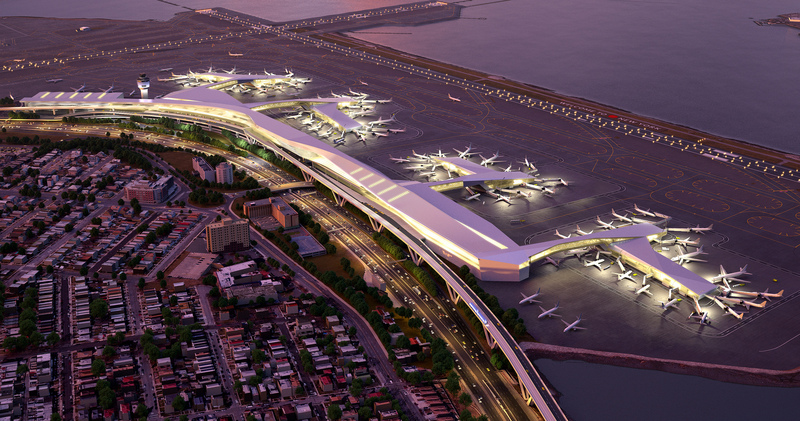 LaGuardia Airport is soaring into the future, at least according to Gov. Andrew Cuomo. 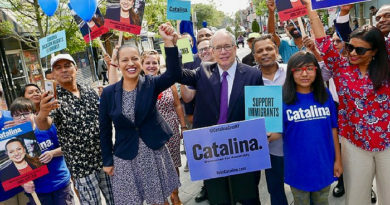 On Tuesday, Cuomo visited Queens to unveil a new overpass to the airport that he said will relieve congestion and facilitate easier access for travelers. The “flyover” — a road extension that rises above Grand Central Parkway at eastbound Exit 7 — is part of the ongoing $8 billion LaGuardia modernization project, which includes untangling the confusing thoroughfares that lead to the airport. Gov. Andrew Cuomo unveiled the new overpass at LaGuardia Airport on Tuesday. Photo Courtesy of Gov. Andrew Cuomo. Cuomo joked that while growing up in Queens he often declined to pick people up from LaGuardia. The flyover will serve as the new primary access point for terminals B, C and D and the Delta gates. Cuomo said he expects the road to handle 20 percent of the 18,000 vehicles that visit LaGuardia terminals every day. It will serve as one of the airport’s four main access points. 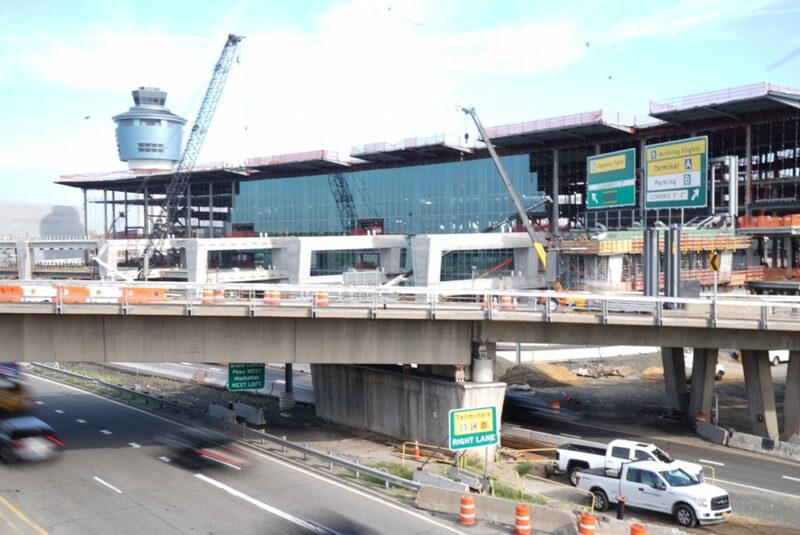 By the end of the modernization project, the airport will have 26 new flyovers and bridges to replace the 15 that stand there now, and will help to eliminate the need for traffic signals throughout the airport. By the end of the project, the 19 current traffic signals between Terminals B, C and D will be reduced to three. 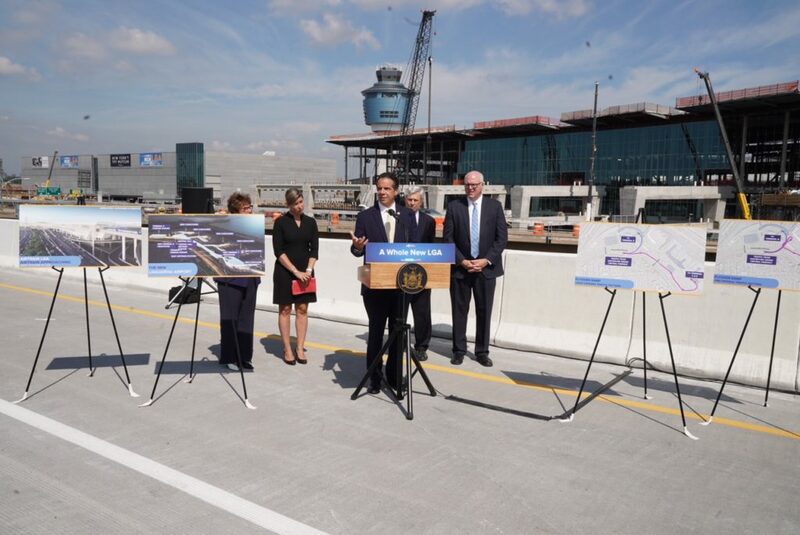 At the unveiling of the flyover, Governor Andrew M. Cuomo spoke of the patchwork approach to repair the airport had undergone in past years, causing a confusing complex of roads that made LaGuardia difficult to navigate. The airport will continue the modernization project in the coming years, even as record number of passengers continue to traverse its halls. In February, the new Terminal B garage opened and, later this year, the first gates of a new Terminal B will open. An entirely new Terminal B will replace 54-year-old Terminal B and is projected to fully open in 2021. Delta’s new Terminal C, on which work began a year ago, will open as the new Delta Arrivals and Departures Hall in 2021 as well. Delta will redesign Terminal D and conncected the renovated facility to the new Terminal C by 2026. The Port Authority of New York and New Jersey has committed $1.5 billion in funds for an AirTrain LaGuardia to link with the Long Island Railroad and the No. 7 line at Willets Point. The Port Authority hosted a series of public hearings in the neighborhoods around JFK last month. 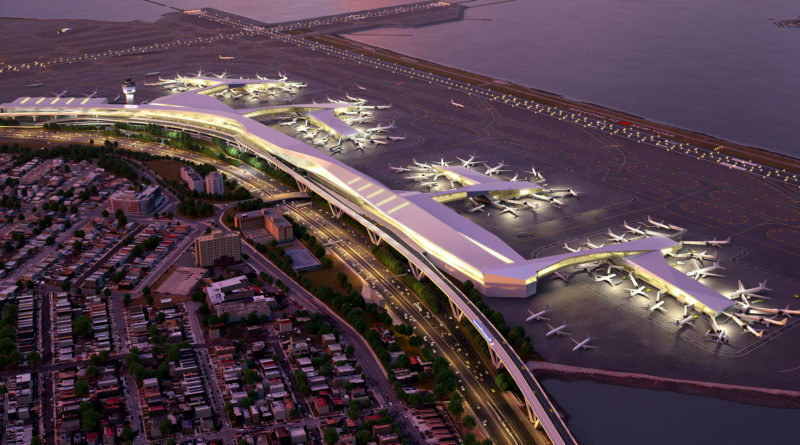 The $10 billion JFK project, initiated by a $1 billion capital commitment from the Port Authority, will have a significant impact on residents of St. Albans, the Rockaway peninsula and other neighborhoods near the airport. Community members said the presentation remained light on details. 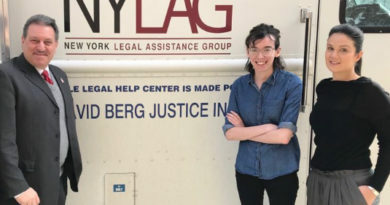 “It was a good introduction for people who aren’t familiar with the project,” said Barbara Brown, the chair of the New York Community Aviation Roundtable’s JFK Committee and the Eastern Queens Alliance. Brown said the panel did not sufficiently address the project’s environmental impact.